Sue Leonard | The Death of Father Gerry Reynolds. The Death of Father Gerry Reynolds. 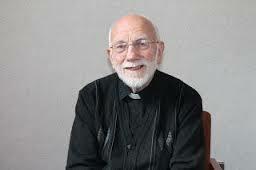 I was saddened to hear of the death, yesterday, of the great peacemaker, Father Gerry Reynolds. I interviewed him for Reality magazine back in 2009. This article, below, has been quoted, in the BBC amongst other outlets, as part of the media coverage of his death. Father Gerry Reynolds is a happy man. Always interested in ecumenicalism, he feels that he is in the place God intended him to be. For the past 25 years he has lived in Clonard Monastery in Belfast; and his work there has had a profound effect on the community. Along with Father Reid he is a legend; commanding enormous respect. Born in Limerick, Fr Reynolds always wanted to be a priest. Liking the missionary aspect of the redemptorists, Fr Reynolds took his vows in 1953. He studied for a BA in Galway, then when back to the seminary to finish his theology. A spell working in the publications followed. In 1975 Fr Reynolds was assigned to be the leader of the redemptorist community in Limerick. “This was a difficult time,” he says. “A time of transition in community life. After the Vatican Council all the religious councils had to rethink their meaning and reshape their constitutions and statutes. It was a time of questioning the meaning of the priesthood as well. His next position, in Athenry was much happier. “I began to feel young again.” There are two events, in particular, that father Reynolds remembers from that time. The first was the excitement on hearing that Pope John Paul 2nd had been appointed; the second was the Papal visit to Ireland in 1979. When he was asked to go to Clonard Monastery in Belfast in 1983; and encouraged to reach out to the people of the other churches he was very happy to be assigned. Because his belief in ecumenism had grown over the years. Fr Reynolds was also influenced by Charles de Foucauld; the French priest who died in the Sahara in 1916. “He lived among the Touareg people and saw himself called to be the Universal brother at the heart of the Christian vocation. A group of priests in France; inspired by his experience, began a fraternity of priests called Jesus Caritas Fraternity. That has been a big influence in my life. There was one challenge in Belfast. “People would say, ‘there will never be peace here.’ But we worked out of a great hope based on knowing that God’s purpose is hope for the Christian Church to be truly united in real and fully visible communication. So that in every place we can celebrate the Eucharist together. One church, in many churches. “In preparing for unity we have a project here called Unity Pilgrims. The pilgrims are fully part of our own parish, and they go to Sunday mass; but as well as that they go to a Presbyterian, Methodist or Church of Ireland Church. A WEEK IN Fr REYNOLD’S LIFE. Sunday. I went to Aghagallon Parish to say two mass twice as a supply priest. I had my dinner, and watched the All Ireland hurling match. Then I walked along the Lough Shore. Monday and Tuesday. 7.00 mass. We had two days of meetings for the beginning of the new Triennium. On Tuesday we had Eucharist together, as a community. We had a celebration dinner of pork. Wednesday. 12.20. Mass in the community chapel. I worked on a booklet for an initiative enhancing faith and church. It’s for all Catholics in the parishes to motivate and equip them for the ecumenical church. I visited a sick confer. In the afternoon we had a meeting of Cornerstone Community; an inter church community. Thursday. 7.0 mass. We had 4 sections of the Novena. I officiated at the wedding of a girl I confirmed in the Lady of Peace Church. She had been Presbyterian. I visited a couple whose wedding I did in Edinburgh 5 years ago. I had helped her through baptism and confirmation. They have three children now. Friday. 7.00 mass. I visited the confer in the nursing home and worked on my project. “Each day we have morning, and evening prayer in the church. In my time off I go for walks or visit friends. I love to read poetry; particularly Kavanagh, Seamus Heaney, or Manley Hopkins. I love the old psalms too. Published in Reality Magazine, 2009.